"Dad, you finally saw a total solar eclipse. Now you're a real astronomer", said my younger daughter in the minutes after the August 21 eclipse. It was a joke, of course, but I still winced. This was a sore point with me. Forty-five years of stargazing, on and off, and I'd seen thousands of sights in the sky from earthbound satellites to the Moon, from icy flotsam from the outer solar system to the colorful cloud bands of Jupiter, and all manner of wonders of the deep sky including galaxies billions of years older than our solar system. But I'd never seen a total solar eclipse. I'd come close in 1979. As a 10th grader, I took an afternoon off school to see the Moon cover 90% of the Sun and cast an eerie light across the snow on a frosty February day during the last total eclipse visible from North America. But I wasn't quite on the path of totality. I'd seen many other partial eclipses, most recently a splendid eclipse during the eruption of a massive sunspot in 2014 under pristine autumn skies in the Canadian Rockies. But totality eluded me. This was partly because of bad luck – we've had a 38-year drought of total solar eclipses in North America – and partly because it didn't seem worth the effort to travel halfway around the world on a scientist's modest salary to chase an event that, at best, lasts only a few minutes. After all, a total solar eclipse isn't a particularly rare event, like, say, the transit of Venus. One happens somewhere on Earth every 18 months or so. And there are plenty of images and videos that show what it all looks like. But I could not forget Annie Dillard's magnificent essay about her experience of seeing the total solar eclipse in 1979 in which she wrote, "What you see in a total eclipse is entirely different from what you know." Or more evocatively, in the same essay, "Seeing a partial eclipse bears the same relation to seeing a total eclipse as kissing a man does to marrying him." So when I took up astronomy again a decade ago and I was reminded of the August 21, 2017 eclipse across North America, which meant no need for an expensive eclipse-themed ocean cruise or an overland trek to the far ends of the Earth, I vowed I wasn't going to miss it. I began planning an expedition to see the eclipse in 2010, inspecting weather prospects in towns and cities along the path of totality where the Moon would completely cover the Sun. My plans captured the imagination of my younger daughter, then 10 years old, and we agreed to see the eclipse together in seven years somewhere in the western U.S. I half-joked to her that after we traveled west to see the eclipse in August 2017, in the summer after she had finished high school, we'd continue westward to deliver her to an elite western university, perhaps Stanford or Berkeley, to study something deep and important. To an adventurous 10-year old, it sounded like a good plan. A lot can happen in seven years. Interests change, energy and commitment wax and wane, life gets in the way. But despite several intervening complexities, including an unexpected change in starting point from Ottawa, Canada, to Washington, D.C., the plan to see the eclipse was set into action and my younger daughter and I set up shop for the eclipse in Lincoln, the tidy college town and state capital of Nebraska. Figure 2 - The 'Diamond Ring' emerges just as totality ends on August 21, 2017. Image credit: Amanda Ventrudo. We arrived in Lincoln in a roundabout way at the end of a two-week road trip and musical tour through Nashville, Memphis, and the Mississippi Delta with my wife and older daughter, the musician of the family. We pivoted from the deep south up through Tennessee and into the central Midwest to arrive in Lincoln under a cloudless sky on the day before the eclipse. Our older daughter, sadly, had to return to the real world before the eclipse. But our younger daughter made her way from an expedition in Iceland to join us a few days before the big event. While Sunday was a beautifully clear day in Lincoln and Tuesday was expected to be the same, we faced a grim forecast of nearly 100% high cloud for Monday, the day of the eclipse. This dispiriting forecast forced many Lincoln-based eclipse chasers to awake early to battle westward traffic on the I-80 to get to the Nebraska panhandle where better skies might await. Others left before 6 a.m., hours before totality, to board buses bound for towns just south of Lincoln right on the centerline of the eclipse to hope for the best under a dismal late-summer sky. More wizened observers had already executed long-standing plans to see the eclipse under the usually dry and clear skies of eastern Oregon and Wyoming. But I've spent many years reading weather forecasts and astronomical clear-sky charts, like an ancient Roman haruspex studied the entrails of slaughtered chickens, and I saw some promise in holding fast near Lincoln, perhaps driving just 20-minutes west, avoiding traffic, and relying on the transparency in the high cirrus cloud that otherwise enveloped the sky and the warmth of the Sun to burn a hole through any low-lying cloud. The three of us set up shop on the side of a dirt road that cut through rolling Nebraska cornfields, accompanied by a throng of gentle grasshoppers, without another soul in sight, and hoped for the best. It worked. We saw it, the whole eclipse from beginning to end, nearly overhead in a sky otherwise overwhelmed with thick haze and thunderheads, in which the only clear area was the region around the fast-disappearing Sun. The Moon started swallowing the Sun, right on time, at 11:37 a.m. local time. We watched the encroaching Moon though a little telescope equipped with a white-light solar filter. The Sun was lightly festooned with five small sunspot groups that served as notches to mark the passage of the leading edge of the Moon. 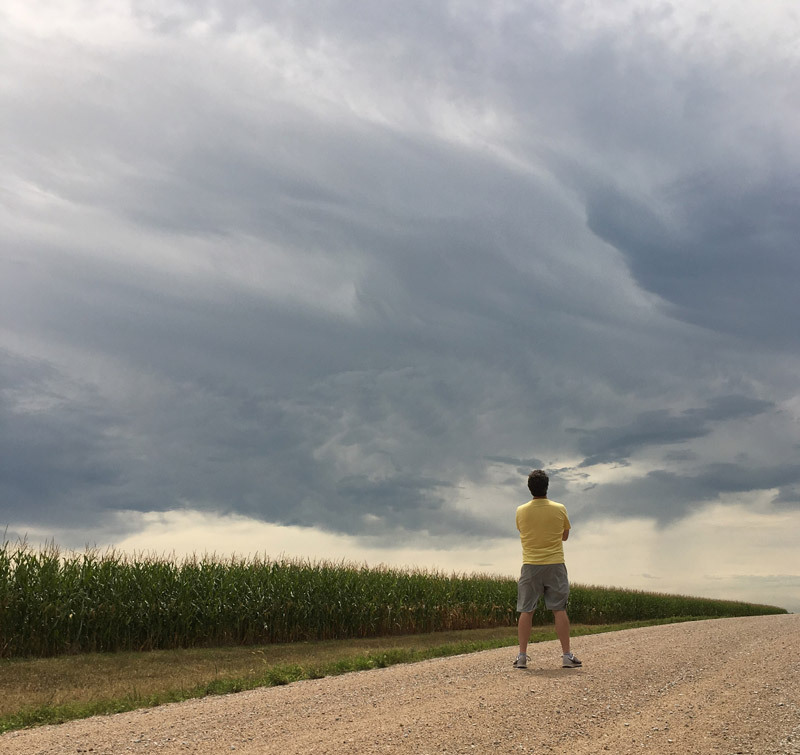 The precarious weather kept my nerves on edge, however, and I brooded and paced up and down the dirt road, helplessly, hoping the thick, dark clouds would hold off until totality. To keep spirits up, my daughter played songs from a hastily assembled "eclipse playlist" including the Allman Brothers' guitar masterpiece Blue Sky, Cat Steven's Moon Shadow, and of course Bonnie Tyler's bloated epic Total Eclipse of the Heart. I took an occasional peek through the telescope and I wondered if I should have traveled further west. But the clouds stayed mercifully at bay, the landscape began to darken slightly with an unnerving silver glow, and my nervous pacing gave way to the sudden thought that I was actually going to see this thing. I tried to keep my wits about me and, as planned, I had my camera set to the correct exposure for a quick snapshot. I had a pair of eyeglasses to give me the best naked-eyed view. I took care to call out instructions to wife and daughter to make sure they removed and replaced their eclipse glasses at the right time. I watched through eclipse glasses as the slender crescent of remaining sunlight grew smaller, smaller, then disappeared. At 1:02 p.m., we removed our eclipse glasses, and gasped. It was an incredible sight, much different than any photograph can show. The Sun-Moon assembly, along with the silver corona, was much larger than I expected and presented plenty of detail to the unaided eye. And it was much more colorful than I expected. 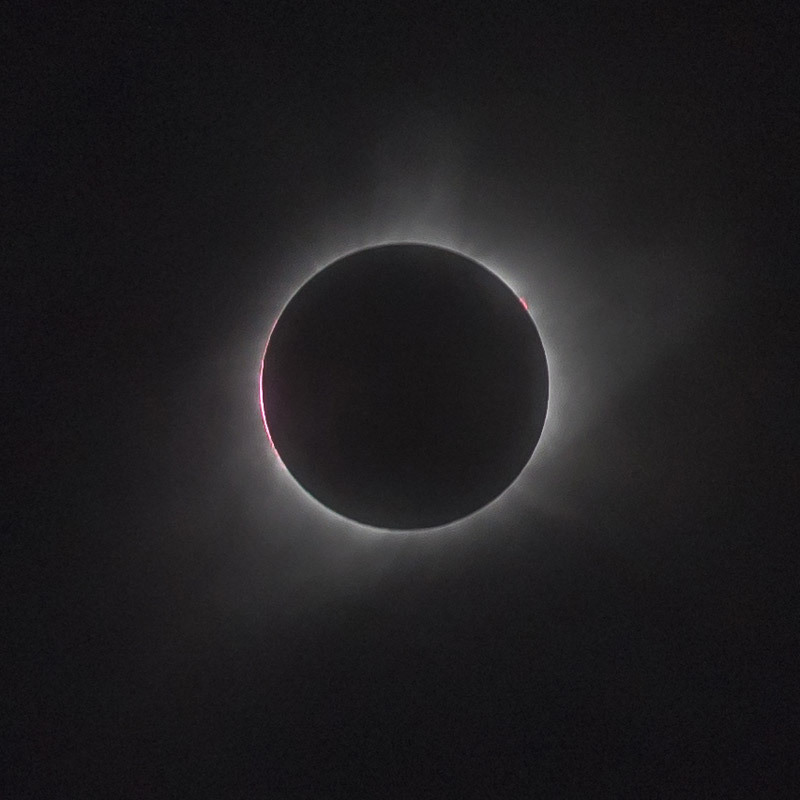 Images of totality show a black sky and black moon separated by a silver-white corona, and perhaps a few pink solar prominences along the edge of the Sun. But to the eye, which has a much higher dynamic range, it looked far different and much more beautiful. 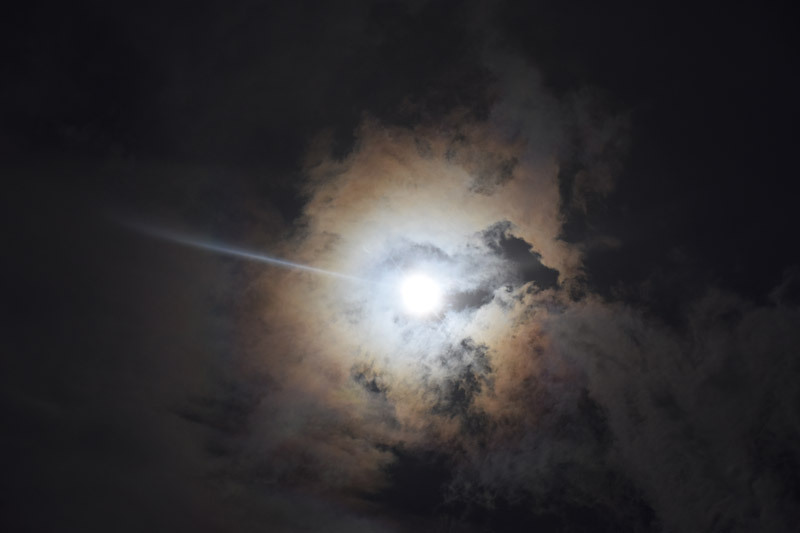 The sky was not black but deep blue, almost violet, and there was the unmistakable red ring of the Sun's chromosphere, the bone-white corona, and the unearthly silver glow of the surrounding landscape. A ghastly orange pall fell upon the entire horizon and back lit the dark-grey clouds. I've never seen an image that comes close to capturing the colors, tones, and contrast of totality. Figure 4 - Colorful clouds just before totality. Image credit: Amanda Ventrudo. Because of the heavy cloud cover, we could see no bright planets or stars. But we were treated to the call of a bewildered rooster just as the leading edge of the Moon's shadow fell upon us. Since this was my first eclipse, I wanted to see the thing rather than fiddle with electronics. Having rehearsed my checklist, and having read about how even professional astronomers are struck dumb and frozen in awe by totality, I remembered to take the solar filter off my little telescope a few minutes before totality so we could get a close-up look. It all went according to plan except for one thing: we were so awestruck that we forgot to actually look through the telescope! We just absorbed the experience, in awed silence, without optical aid. 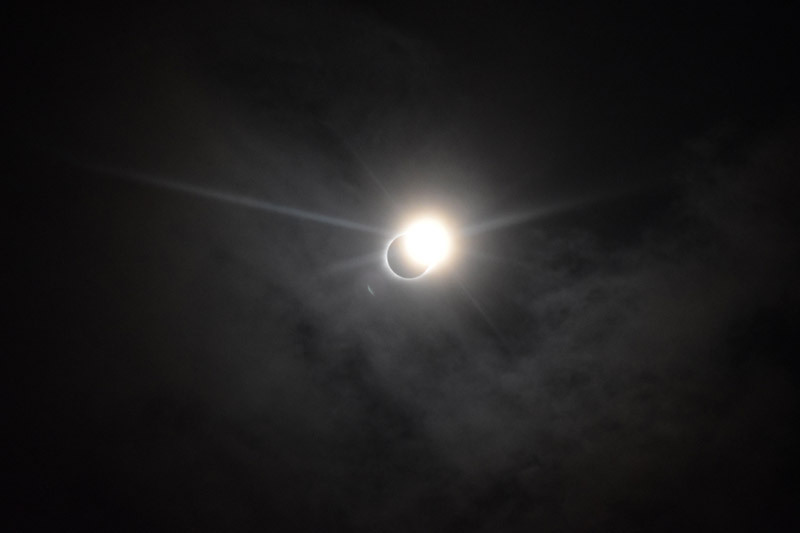 But I did manage to snap a few pictures and remind my wife and daughter to look away as the 'diamond ring' of the Sun's light appeared at the Sun's limb and totality came to an end. It was the shortest two minutes and twenty-four seconds of our lives. I was a little giddy after the experience, even a bit frazzled. But I now understand why people chase total solar eclipses, and I'm going to have to see another. I've experienced only a handful of sights that I've studied and prepared for, yet been completely overwhelmed and dumbstruck with amazement when seeing them in person. The Sistine Chapel. The Alhambra. The birth of a child. And now, a total solar eclipse. The Sun and Moon kept their appointed rendezvous. And now that the eclipse is over, my younger daughter will keep her appointment to study something deep and important, not in California, but at an elite eastern university. And this eclipse has reminded me again of the slow but steady passage of time, and to always keep in mind that, although the days may sometimes pass slowly, the years move by at a rapid clip, bringing all they have in store for us in the heavens and on Earth.